CONCORD, N.H. (AP) — Pens that look like hypodermic needles are being sold as Halloween novelty toys, stirring concerns among parents and drug abuse prevention advocates as the country battles a rising heroin and opioid addiction crisis. The pens, clear plastic tubes filled with brightly colored liquid, topped by a plunger and marked with the measuring lines found on syringes, are sold at Target stores and can be found at several online retailers. "I think it's an incredibly bad idea," said Celeste Clark, director of the Raymond Coalition for Youth, an organization in New Hampshire that works to reduce substance abuse. "Given today's epidemic that our state is in, it just seems like a no-brainer that something like that shouldn't be on the shelves." A spokeswoman for Minneapolis-based Target said the company had heard complaints from consumers but will leave them on the shelves. "We have not made any changes to our store Halloween assortment related to this product," Molly Snyder said. "At Target, our intent is never to offend any of our guests, and we appreciate their feedback. We have shared this feedback with the merchants for them to consider as they plan for future merchandise assortment." The backlash began when North Hampton teacher Susan Haight saw the pens amid the holiday displays at a Target store and pressed the retail giant to pull them off the shelves. "Syringes are being found on beaches, playgrounds, parks, and parking lots across New Hampshire," Haight told The Associated Press in an email. "We do not need young children confusing real syringes with the toys they got from Target." The pens aren't the first toy to draw ire: Candy cigarettes, gum that came in packages that looked like chewing tobacco and candy that came in prescription-like bottles have been criticized for luring kids into bad behavior. Clark's coalition was successful in 2013 in getting the manufacturer of the prescription candy bottles to pull them off the market. 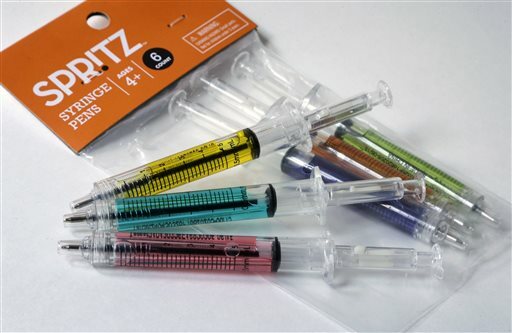 The syringe pens, labeled as appropriate for ages 4 and up, could easily confuse young children who wouldn't know the difference between a real needle and a toy, Clark said. "It's exposing kids to hypodermic needles when we really should be raising awareness to their danger, especially now when they're finding them in parks, on walking trails, on biking trails," Clark said. Nikki Shipley of Fort Lee, Virginia, has two children, ages 7 and 12, and said the controversy over the pens is overblown and parental responsibility should be part of the discussion. She wonders if parents should try to ban things like superhero movies because their child might get hurt trying to copy a hero who can fly. "Through time, society has found more ways to blame others for things," Shipley said in an email. "A needle pen is not the cause of a heroin epidemic, nor does it promote it." Jack Wozmak, New Hampshire's senior director for substance misuse and behavioral health, said the pens trivialize the drug abuse crisis. The U.S. Centers for Disease Control and Prevention has reported that heroin-related deaths nationally nearly doubled — to 8,200 — from 2011 to 2013. "I think that it is the most societally outrageous marketing scheme that I've seen in a long time," Wozmak said. "I'm not sure that people will understand that it's a toy at age 4 and up or whatever the age range is, and I'm not sure they'll know that the hypodermic needle they find on the playground is not a toy."